1) My thoughts / opinions don't matter. It's a state issue if a flag is flown at its Capital or part of their State flag. The citizens of each State should decide for themselves if the flag is flown when and where. They should not care what people elsewhere think. Especially the talking heads on Fox News and CNN, the loud mouths on talk radio, or any politician or celebrity who will say anything they think is trendy or what the general public wants to hear. 2) The Confederate flag shouldn't be flown at the Capitals. None of the 13 southern States that made up the Confederacy belong to the Confederacy any longer. The only flags that should be flying over the State government buildings should be the US flag and the State flag. 3) I have no problem with the Confederate flag being part of a State flag. It was a major historical part of the Southern states (and our country for that matter). 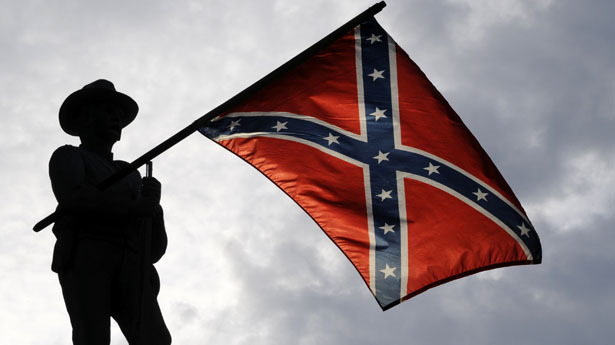 4) The Confederate flag should fly over Confederate war cemeteries and memorials. The people buried there died for that flag. While a major factor, slavery was not the only reason for the war and why they fought. Around a half million Americans died during the Civil War, millions more were crippled, entire cities were burned to the ground and we should not forget that. We need to remember and learn from our history, before we repeat our mistakes. As I said above, slavery was not the only reason for the war. State and individual rights were being trampled on by an ever growing Federal government and there was very poor economy (especially in the South) that caused a lot of division. Sound familiar? No, I'm not suggesting we are heading towards another civil war, but we are on a path of self-destruction due to our country getting more and more divided as the two main political parties more farther and farther from their base and lean more and more extreme. We are repeating the same mistakes that lead to the War Between the States. A nation dividing itself over a host of issues that could be resolved with some effort, under an ever expanding and controlling Federal government. What bothers me about this big push the most is the half baked thought that it will improve race relations. It will put just as big of a dent into racism as Prohibition put a dent into alcoholism. But it's a quick feel good action for those who feel we need to do something, yet aren't willing to do something that involves dealing with the real issue. Taking a rebel flag away from a racist won't fix the racist. It will just make the racist blend in so it won't be an eyesore that reminds people there is evil in this world.